Description: Florida. The earliest map of the Peninsula. Fine impression of this extremely important map. 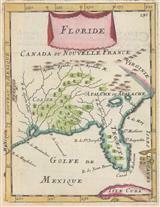 Description: Early miniature showing Florida and the Gulf of Mexico. Title cartouche and later hand colouring. Description: Florida and the Gulf of Mexico. Large decorative border and detailed scenic cartouche. Coloured. Description: St. Augustine. Plan of the town and the mouth of the Matanzas River. Italian map based on Bellin. Coloured. Description: Interesting map of the Florida Peninsula and Panhandle dividing the state into East and West as per the Spanish divisions. Coloured. Description: St. Agustin. Chart of the Bay and Port of St. Augustine. Description: Mouth of the St. John's River. Description: Florida and Georgia. Coloured. Description: Florida and the Bahamas. Important early map centring on the peninsula. Original colour. 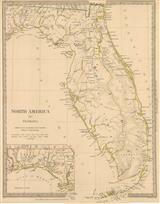 Description: Florida showing the Everglades crossed by Indian Paths and the Seminole regions. Outline hand colour. 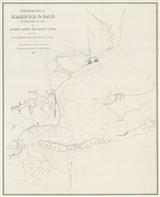 Description: Small map showing the Theater of War during the Second Seminole War and together with the route of the military road from Camp Augusta to Fort Brooke. Description: Florida. Map of the Peninsula showing the extent of official surveys as per the Office of the Surveyor General.